eMedia Software - ACE Peripherals ::: Completing I.T. eMedia is the perfect tool for graphic, magnetic, and electronic personalisation of plastic cards on PCs. eMedia facilitates the creation and printing of all your cards: company badges, business cards, membership cards, loyalty cards etc, and gives you the possibility to build a source of different card layouts instantly. It is supplied in its Standard version with the Pebble and Dualys. A 30-day trial version is delivered with Tattoo, Tattoo Rewrite, Securion and Quantum. eMedia also has a Pro version for connections to databases (MS-ACCESS, Microsoft SQL server, Oracle, ODBC) and access to a number of advanced functions. For advanced Mifare card management (contactless cards),you can get an Expert version of eMedia, available from our partner MedieSoft. 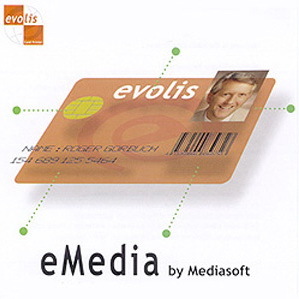 For more information, contact Mediasoft or your nearest Evolis reseller.